Home / Congress / Corruption / Kalmadi / Latest Post / Manmohan Sing / Public Interest / Is Manmohan Singh Spilling The Beans? Is Manmohan Singh Spilling The Beans? Rarely have I seen Manmohan Singh showing any emotions. I am not sure if MMS was asked to keep his mouth as well as his emotions shut while running the proxy government or it his very nature, but one thing that I never found with MMS is his emotions bursting out. Yesterday was a different day. A different day on many accounts. In a rare press conference after he demitted his office, MMS was all over the place with sentiments flowing in every direction. In just about an hour, MMS not only blasted the present government but also defended himself from all the scams that happened right under his nose during his tenure. The reasons of such a hurried press brief could have many motives but we aren’t going there just as yet. But one thing remarkable here is the way MMS defended himself; note the word ‘HIMSELF’. He never talked about his ministers or his cabinet but solely talked about himself. Perhaps he didn’t want to go to the history books with a bad legacy tucked behind him. Even more surprising was MMS’s last minute visit to 7 RCR to meet Modi, the man whom he criticized in the morning. Well, the records at both ends suggest the meeting was all about discussing the present day economic situation of the country but we know how far it can be accepted on its face value. And, I have reasons to smell fishy. Certainly after the manner, in which MMS purposefully defended only himself, not even his tenure as the PM of this country nor his cabinet ministers or the Congress party. People in Congress may not agree but I am confident that, MMS’s press brief and his subsequent meeting with Modi must have left a lot of nervous faces in the Congress camp. This nervousness was evident from all the Congress representatives yesterday. All were trying their best to hold their forts but the truth came out nonetheless. Keeping these Congress’s loot defenders aside for the moment, it would make an interesting observation if we closely look at the words spoken by MMS. “I haven’t misused my position to benefit myself or my family members”, he said to the gathered media. See, he just defended himself. No mention of his corrupt cabinet ministers or his erstwhile party. We can dissect his statement, depending on which side of the fence we are sitting but this is a strong statement in every way. It is quite believable too. Since Dr. Singh, with all his flaws, is a man of honor and dignity, we can safely assume that, he may not have taken side of the corrupts to benefit himself or his family. His credibility was never a question at any point of time. What were questionable are his leadership qualities and his efforts and intent at curbing corruption, right within his cabinet. When one finds, at least five cabinet ministers had to resign on graft charges, it only shows, MMS was a reluctant leader who never tried to stop the rampant corruption. Whether that reluctance was by choice or by advice is the thing remained to be analyzed. That said, in either way, he stands answerable to the public at large. I am glad; he finally answered few of the pending questions, even though he cleverly tried to deliver half-truth. Take example of 2G scam for starters. From zero loss to latest comments by the TRAI chief Mr. Baijal, we have travelled a long distance. In the murk of 2G, the only name that constantly popped up other than A Raja’s is that of MMS. For an honest man like MMS, such abject association of him with corrupt and jailed individuals must have been painful. Same is the case with Coal scam. Every time, we had people who exposed how MMS was helpless in dealing with the corrupt, even after knowing all the facts first hand. Be it Sanjay Baru or the latest entrant Mr. Baijal; all had one thing in common to say as far as describing MMS’s regrettable tenure goes – he was running a proxy government with no power with him because there were extraneous people who were calling the shots. MMS was just the frontend of a highly corrupt and self-serving regime. He was always forced to tow the lines of his bosses, even in matters of corruption. By force MMS was asked to take the blame so that the real powerhouses are kept benefited from these mega loots. No, I am not exonerating MMS of his responsibilities or the lack of it as the PM but at the same time we must not forget that MMS as PM was as powerful as a Tata Nano or may be even less. He was controlled by a highly deceiving unconstitutional body comprised of the Gandhi family and few those who are very close to the Gandhis. People like Ahmad Patel for instance were enjoying extra constitutional powers that even MMS wasn’t entitled to. In one of the instances, we were even told that, before MMS could sign official documents, they were sent to Sonia Gandhi for her approval. 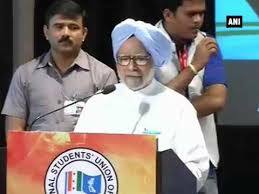 I again repeat – we can’t absolve MMS of his mishandlings but was he the first and last culprit? Certainly not. Every man has a limit to the amount of filth he can take. Once that threshold is breached, the person gets jittery of the scheme of things. Though MMS has a wider threshold, it certainly doesn’t stretch till infinity. Mr. Baijal’s latest salvo may have woken up MMS from his long apartheid towards his own image. For long, both during his tenure as the PM and after losing 2014 general elections, MMS was treated like a scapegoat. Even our media for reasons best known to them, kept on attacking MMS while he was far from being the primary culprit. For me, even A Raja isn’t the culprit-in-chief either. Raja is just another punching bag like MMS. While the real beneficiaries in Congress asked MMS to remain unobtrusive and abide by the dictates, Raja was asked to keep his mouth shut by his bosses in Tamil Nadu. While one was thrown behind the bars the other one kept on carrying the entire blame while the real legatees were never confronted with uncomfortable questions, let alone any action being taken against them. Things seem to have turned full circle. After the loss of power MMS looks like becoming more powerful with his own convictions. That is why, in MMS actually lies the biggest fear of Congress party. They know MMS has all the beans, which he can spill at any point of time. That is the only reason why a highly self-serving person like Sonia Gandhi rushed to meet MMS when a court first inducted him in the coal scam accused list. All hogwash of solidarity was as artificial as the concern for the nation that the corrupts routinely display. SG was never there to show her solidarity with the PM as it was touted by the sycophants back then. She was there to ensure that MMS don’t commit the inevitable out of frustration. The Padyatra SG did along with other top Congress leaders is not aimed at saving the ex PM but to save the cult that is responsible for all big ticket scams of last ten years. The cult which even SG could be a part, did all the wrong doings while leaving the PM to fend for himself and Sonia Gandhi knows it only too well. She also knows, a middleclass individual can’t be stretched too far with his image and reputation because he may not be as thick skinned as an average politician is. That is why there is no Sonia Gandhi seen anywhere near MMS since yesterday because she understands, the threshold level is already breached. I am sure, backdoor talks may be on to convince MMS to keep on shouldering the blame but coming out in the open could be too risky an affair at this point of time and no one knows better than Sonia Gandhi herself. To even make matter worse for Sonia Gandhi in particular and Congress party in general, MMS promptly met with Modi in the evening. While the corrupt syndicate can only hope the discussion went in the direction as been made public, the chances of things being entirely opposite can’t be ruled out. Knowing Narendra Modi and his spectacular abilities to exploit a situation as per his need, the corrupt can’t breathe normal. The danger may be lurking in their backyard without them having a sniff of the same. Corrupts and their sycophants are not necessarily worried about what happened yesterday but what could happen in future. They never had any love towards MMS. Sticking true to their overzealous attitude of dumping after the expiry of usability period, they can sacrifice a pawn like MMS quite easily but will that be so easy this time could be the biggest concern of all. An irate MMS can inflict a severe damage because he is both the culprit and the witness of this pan India loot. A lot of people need to be protected from the possible future wrath of MMS and that certainly not going to be easy because there is a no-nonsense government at the center. Honestly, MMS put the entire Congress lot in a highly unenviable situation. They have to protect so many things in double quick time, not just the scams they so nonchalantly materialized. That also includes the Jamai Raja, Pappu, Pinky and the Queen herself. Easier said than done but the Congress would try to defend the fake image of a lot of people. Hope, they won’t be successful.